On this day in 2006, Harry Redknapp today told Pompey: It would have been easy to watch you go down. The Blues boss said he could have taken the simple way out by staying at Southampton. Redknapp insisted he could have been bitter and let Pompey punish themselves for letting him go the previous season. But instead he preferred the challenge of trying to save the club he took into the Premiership. And he told fans he was still the man who could achieve the improbable, after returning to Fratton Park just three months previous. Speaking to The News at the time, Redknapp said: ‘You keep trying. No-one wants to succeed more than I do. That’s what I can tell everyone. No-one’s trying harder than me. ‘If you don’t succeed but you’ve tried your hardest, then you can’t question yourself, can you? ‘If you haven’t tried hard, but taken the money and not bothered, then you deserve criticism. ‘I could have stayed at Southampton and watched Pompey get relegated and gone: “Oh well, serves them right for letting me go and what happened before. What goes around comes around. Easy”. ‘But I didn’t do that. I came back here and took on a massive challenge that most people thought I would fail in. 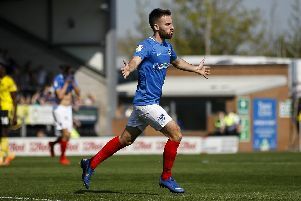 Pompey had taken just eight points from 13 games since Redknapp returned a year after quitting following a fall-out with Milan Mandaric. But the then 59-year-old believed he was still as good a boss as the one who had Pompey in the top half of the Premiership before he left. He added: ‘I wouldn’t have lost the knack if I was managing Chelsea, would I? We’d be winning every week. ‘But I walked into a team here who had been on a long, long losing run since I left. I’m trying my best to turn it around. But it’s not going to be easy. ‘The first time I became manager here in 2002 I took over with five games to go, and we didn’t win one of them. ‘No-one’s got a magic wand. You might get a result or two, like I did early on, but that was against West Brom and Fulham at home. ‘The club has been on a bad, bad, bad run since the day I left, and I’ve found it very difficult to stop that run. ‘People might criticise in the media, but that’s how the game is. They love to build you up and knock you down. If you go along in the middle, you’re not news, are you?